If you have to give up caffeine, but coffee is just too good to let go, there is an alternative - decaf coffee! In theory, decaf coffee should provide you with the same alluring taste and aroma minus the downfalls of caffeine, but is it really so? It is actually very hard to find a cup of decaffeinated coffee that will be able to fool you for at least one moment and make you think that it is the real thing. What are the Decaffeinating Methods Used Now? Which Method is the Best One? How to Prepare the Best Decaf Coffee? Is Decaff Coffee Good or Bad for You? After all, not every regular brew coffee tastes satisfying either. Some types and brands are way superior to others, and so is the case with the decaf coffee too. This is where I step in. I have drunk my way through the most popular brands and found you the best decaf coffee currently available on the market. Are you eager to try it too? Read on and find out more! Before we move on to talk about the best decaffeinated cup of coffee you can come by, we should honor this nectar of the gods by learning a little bit about it! Decaf coffee has at least 97% less caffeine than the same regular coffee. Decaffeinating coffee has a long history as the practice began in the early 1900's. At first, decaf coffee tasted rather bland and gave a bad aftertaste. In this way, it earned itself some bad reputation, but modern decaffeinating methods greatly improved and you can now enjoy a cup of decaf that will satisfy even the most extreme coffee enthusiasts. The original decaffeinating process was exclusively done by the use of chemicals. Besides, the earliest decaf coffees were only “low-caffeine.” As a result, the coffee was lacking flavor but still had a significant amount of caffeine. There was simply no point in having it. Luckily, the process of decaffeination has significantly improved and modernized over the years, and the decaf coffee nowadays can rival some of the top-notch regular roasts on the market. There are multiple methods of decaffeinating available today, each with its ins and outs. As an educated coffee enthusiast who’s into decaffeinating, you should know about them. Learning about the methods will get you to select the one that suits best easier. Soaking them in warm water and the solvent which dissolves caffeine. Pumping in some fresh water to replenish the beans. This process includes the use of chemicals, and you are troubled by this fact, am I right? The good news is that the Methylene Chloride, which is most often used as the solvent, does not represent a health risk. Why? Well, the minute traces of this chemical will completely evaporate during the roasting process. The FDA has never found any traces of this chemical in any green coffee tested so far. Pumping the water off into a separate tank and adding solvent. Caffeine-free water is pumped back into the beans. The idea behind this process is to return all the flavor components back into the coffee beans. Unfortunately, a lot is lost. Washed out taste not worth the trouble. Pumping the water through charcoal filters. Pumping the caffeine-free water back into the beans. Once again a bit wishy-washy taste. Swiss Water Process decaf coffee costs more since this method destroys the caffeine and thus prevents the manufacturers to resell it to pharmaceutical companies. However, the fact that this method is chemical free and environment-friendly is a BIG plus. This is actually the only method used for the production of the organic decaf coffee. In my humble opinion, this is the best method developed so far. How so? Well, there is no soaking! The flavors stay locked inside the beans as all the precious oils are preserved. The coffee beans are subjected to a highly compressed form of carbon dioxide. CO2 triggers a chemical reaction and merges with the caffeine from the beans. Charcoal filters finally remove the caffeine from the carbon dioxide. As you can see, I am rooting for the CO2 method. However, most decaf coffee on the market today has been produced by using one of the solvent-based methods. I am not fully aware of why this is the case, but I have a feeling that it has something to do with the cost of production. So if I have to choose among solvent-based techniques, I wholeheartedly vote for the Swiss Water Process method. Extra Info: Decaf coffee is never 100% free of caffeine. There can be as much as 3% caffeine left or as little as 0,1%, but if you have 0% tolerance to caffeine you must remember this and avoid decaf coffee as well! 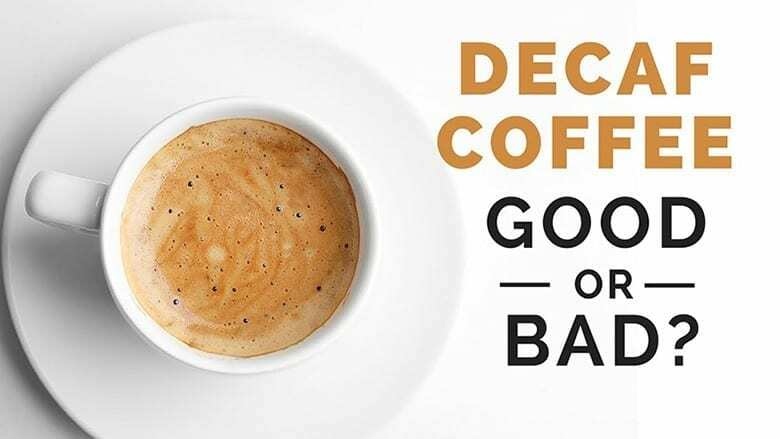 The decaf coffee you choose to buy has to be produced by a reputable roasting company that buys the highest-quality decaffeinated coffee beans available. It should be purchased as the whole bean and as fresh as possible. Store it appropriately - keep it in a dry and cool place, but most importantly in an airtight container that will keep it fresh for longer and preserve its flavor. Grind it properly - invest in a high-quality grinder as that will influence the final taste and texture of your decaf coffee greatly. Always grind the decaf beans on fine or medium. Make sure that you use your grinder ONLY for decaf coffee, or otherwise you risk drinking the caffeine from the previously ground regular coffee. ​Brew it properly - Finally, you have reached the final and easiest step. Decide what type of coffee you are up to- an Espresso, a Latte, or perhaps a creamy Cappuccino. Of course, use high-quality coffee maker if possible, and follow the instructions and measurements to the letter (if the coffee comes out too weak or too strong, adjust them later on). If you have done everything right, the taste will be intense and rich! Extra info: Most decaf coffee on the market today is produced using Arabica beans as they have naturally low caffeine content. Most people consider coffee to be their wake-up drink. A cup of coffee provides them with extra energy needed to get through the day. However, not all of us are as lucky - some people suffer from headaches, shaking or excessive sweating all due to caffeine. For them,decaf coffee provides an opportunity to enjoy the taste they have become accustomed to without suffering any dire consequences. It helps prevent the development of certain cancers, heart diseases, and type 2 diabetes. It is nutrient rich and provides you with magnesium, potassium, and vitamin B3. Now that we’ve learned about decaf coffee and everything that goes into making this beverage, it’s time to utilize this newfound knowledge to reap the benefits. The market is stuffed with brands and products, and now let’s review and compare the best twenty. Eight O’clock decaf coffee seems to have been around for ages; it has a very long tradition here in the USA. It is easy to find and reasonably priced, and that only adds to its popularity. It is by no means at the top of the spectrum when it comes to origin or quality, but the taste is there, and everyday users are searching for exactly that- good flavor at the even better price! If you prefer organic, environmentally friendly coffee beans, this is not your brand. It is decaffeinated via the direct method, and that means chemicals (in this case methylene chloride) were used in the process. On the bright side, Eight o’clock is 100% Arabica. It is a brand you can trust, and there is no need to break your wallet when you crave for a cup of medium-roast, flavorful decaf coffee. The taste is more than satisfying- there is no bitterness or aftertaste. Quite oppositely, it is smooth, rich and aromatic. Cafe Don Pablo decaf coffee is a true Colombian brand. It is made from Colombian Supremo beans. 100% Arabica, of course. This coffee is not mass-produced like the Eight O’clock decaf coffee, but rather roasted in small batches just before it is packaged and shipped off. Therefore, it is fresh by default. Don Pablo coffee is decaffeinated using the Swiss Water Method. There are no chemicals used. It is all-natural but not organic. When it comes to taste and aroma, Don Pablo shines like a bright star in the dark decaf sky! It is by no means acid or bitter like most low-caf brands. The taste is complex and flavorsome and features natural cocoa and caramel notes. You can even sense a hint of citrus! It will complement most desserts and pastries. If you are a true medium roast aficionado, you are sure to feel a bit disappointed as Cafe Don Pablo tastes more like a dark roast. If you do not mind that, you are up for a smooth blend well worth trying. You can probably guess that the Kicking Horse is decaffeinated using the Swiss Water method, as that is an only choice for organic brands. This truly rich coffee comes from Central and South America and is 100% fairtrade. The company really pays attention to the well-being of all those involved in the process of production- including our planet! As a true dark roast blend, Kicking horse decaf coffee​​​​ features a hint of bitterness and burnt aroma. Although this is minimal, the medium roast followers are sure to sense it and despise it. This coffee is made for true dark roast admirers that will appreciate the depth and complexity of its flavor. It is rich and seductively aromatic with a mellow finish. Although the taste will somewhat depend on the brewing method you choose; some aromas seem to dominate in most scenarios- that of hazelnuts and chocolate. One of the best dark roast blends with low caffeine content, if you can pay the price! The downfalls? Oily beans that can jeopardize your expensive coffee machines and grinders! Savor the flavor of smooth and luscious vanilla with this decaf coffee. The distinct taste comes from the decaf beans that are used, which were sourced from South and Central America. The flavor can also be attributed to the use of 100% Arabica beans. To add, this is also Kosher-certified and gluten-free. If you think that decaf coffee is too weak, you have to taste this! Despite being decaffeinated, it comes with a robust flavor that is sure to wake you up in an instant. This is also a dark roast, which is why the flavor is more complex and it tends to be less acidic. It is made by a company that has been around since 1966. For decades, they worked with the growers in some of the best coffee-growing regions in the world, providing an assurance that they will use only top-quality beans for a premium coffee. Do not let the name of this coffee fool you! It is not as boring as it sounds like. It has a full-body and does not require the addition of any flavoring to tickle your taste buds. There are notes of milk chocolate and blueberry. This is decaffeinated through a method known as the Swiss Water process. Basically, it starts with unroasted coffee beans, which are decaffeinated using a method that does not involve solvents. The top-notch taste and aroma of this coffee can also be attributed to the use of only top 2% of the raw Arabica beans in the world. Gourmet coffee does not need to be expensive. With this blend from Gevalia Kaffe, you can make it on your own at home and enjoy the same delicious taste of the ones in over-priced coffee shops. This coffee is made using 100% Arabica beans, providing you with the assurance of its robust and full-bodied flavor. It is also 99.7% decaffeinated, so you can enjoy it as much as you want to. No need to worry about palpitations and other side effects of caffeine. One box of this coffee is inclusive of 12 K-cup pods. They are compatible with Keurig 2.0 models. This coffee is in the form of whole beans, which will provide you with the freedom to grind it depending on the brewing method that is desired. As the beans have Sumatran origin, it is creamy and sweet. It is a medium roast, and you can expect a bold body. The coffee also gives out chocolatey and earthy undertones. These coffee beans are grown in Aceh in Sumatra at an approximate elevation of 1,200 to 1,500 meters. They have been wet-hulled. It makes the coffee moist for an extended period and is also the one responsible for minimizing acidity. Made by a trusted brand, this is another decaf coffee that should be on your radar. It is 100% Arabica whole bean coffee, which will provide you with the opportunity to grind it based on the size that is most appropriate for your needs. As a medium roast coffee, it has oils that are still visible on the beans. The quality of the beans is slowly lost, and the roasting flavor becomes more evident. It has a balanced and complete flavor with hints of caramel, citrus, and berry. If you are a regular coffee drinker, Maxwell House is a name that you will easily recognize. This original blend is made using beans that are naturally decaffeinated, making it possible to preserve its natural flavor and aroma. This coffee is already ground, so it is ready to enjoy right out of its packaging. It is made using only 100% Arabica beans, which have been sourced from the best regions in the world to guarantee that it will tickle your taste buds while providing a caffeine fix. One of the best things about this whole bean coffee is how it has been through a slow roasting process. This makes it possible to achieve a more balanced and fuller flavor. Plus, it is packaged immediately right after roasting, which is beneficial in terms of retaining its freshness. The coffee beans are sourced all the way from Costa Rica. The soil and the drainage in the region are excellent, directly impacting the flavor and aroma of this decaf coffee. It has a sweet and mild acidity, resulting in a clean taste. Since this is a fine grind coffee, you can use it even for making espresso at home. No more need to grind whole beans on your own! Plus, since it is a dark roast, you can expect pronounced bitterness that does not overwhelm the taste buds. The coffee is made using only the finest 100% Arabica beans from around the world. They have been meticulously selected to provide you with a premium caffeine fix without having to spend a lot. One of the best things about this coffee is that purchasing it allows you to help not only the manufacturer but also the coffee farmers. They work hand-in-hand with local communities to create a sustainable business. Because of this, the manufacturer claims that you will not only be able to taste the difference, but you will also be able to make a difference. The beans that are used in this coffee are from Latin America. It is 100% pure and is not processed using any chemical that can adulterate the flavor of the coffee. While there are many brands of coffee, Folgers is one of the easiest to recognize. Hence, this coffee is another favorite of many aficionados. It is 100% pure and roasted in New Orleans. As a medium roast coffee, you can expect that it will be smooth. From your mouth all the way to the throat, the smoothness of this coffee is sure to make a positive impression to coffee lovers. The best thing about this product is perhaps the AromaSeal technology, which will create an airtight seal. This allows freshness to be retained. You no longer need to go to Seattle’s Best if you need a quick caffeine fix. You can incur huge savings by buying this distinct coffee blend and making your own drink at home. The Portside Blend is known for being a medium-roast coffee, which is perfectly balanced. It is an ideal choice for people who love to enjoy the best of both worlds – sweet and bitter. For the best experience, the manufacturer recommends that you mix one tablespoon of ground coffee with 180 ml of water. If you want to enjoy a delicious cup of Joe, you no longer need to head to the nearest coffee shop. With this ground coffee from Illy, you can make one on your own. It is a medium roast, so you can enjoy a well-balanced flavor. The coffee is made using 100% Arabica beans. They have been nitrogen-packed, which was beneficial in terms of preserving its freshness. The beans have also been air-cooled and processed in an air-free pressurized environment to preserve its quality. When people hear the word espresso, a lot instantly assume that it is packed with caffeine that will instantly perk you up. With this coffee from Lavazza, however, you can enjoy a decaf version while still making sure that your taste buds will be in for a treat. This is a full bodied, medium roast coffee. It has a combination of sweet and fruity flavor, which is quite a deviation from a traditionally bitter espresso. The beans that are used in this coffee are harvested in America. However, they are roasted in Italy in a process called convection air roasting, which prevents the coffee from having a burnt taste. One of the best things about this coffee is how it used the Swiss water process to remove most of the caffeine. This is a 100% chemical-free procedure. It is also eco-friendly. This is a product made by a micro-roaster based in Brooklyn, New York. The company has been established only in 2009, but it did not take long before it was able to make a name for itself. As for the tasting notes, it is a medium roast coffee that delivers a full body. It is made using Central American beans with a clean aroma and low acidity. The process of making this coffee is the one that is responsible for its premium quality. The beans have been hand-picked and sun-dried. They have been roasted by artisans who are masters of their craft. The good thing about a whole bean coffee like this product is that it is versatile. You can decide on the grind size depending on how you intend to brew it. It should be noted that this is a single-origin coffee, which means that it is made using only beans that have been grown in a specific region. More so, what makes it different from most of the options mentioned above is how it is a high-performance coffee. It has wild MCT oil and pastured butter, which are two ingredients that will help to perk you up in every sip! I hope that I have succeeded in proving my point- you can find a decaf coffee with an equally rich and satisfying taste and aroma of its regular counterpart. It is not mission impossible as some deem it! ​It is not only a perfect combination of quality beans and artisan roasting, but it is also easy to come by, always fresh and reasonably priced. It is neither medium nor dark- it rather appeals to all true coffee aficionados. What is the only thing that could make it better? If someone would serve it to me right now! Do you agree? I would really appreciate your opinions and comments! Hi there! This post could not be written any better! Reading this post reminds me of my old room mate! He always kept chatting about this. I will forward this article to him. Fairly certain he will have a good read. Thanks for sharing! My brother recommended I might like this website. He was totally right. This post truly made my day. You can’t imagine simply how much time I had spent for this information! Thanks!